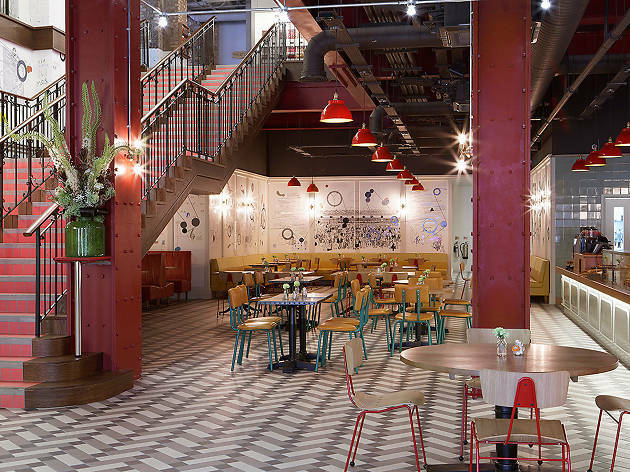 The Picturehouse's latest branch, opened in the summer of 2015, sits on the site of the old Cineworld in Piccadilly's Trocadero centre, which has had a stunning revamp. Distancing itself from the old maze that was former cinema entrance, Picturehouse have walled this up and made a clear entrance on the corner of Shaftesbury Avenue and Great Windmill Street. Inside visitors are met with a grand staircase paired with a film themed mural by US artists Patrick Vale and Paul Davis. There's also a ground floor café. Up a level you'll find the box office and the bar, before heading to one of the seven screens. Still in the same theatres the original screens were, these rooms have been overhauled with larger screens and comfy seats with more leg room. Another climb up a level will take you to the gallery space and a members-only bar with a roof terrace that looks out over the busy streets of central London. 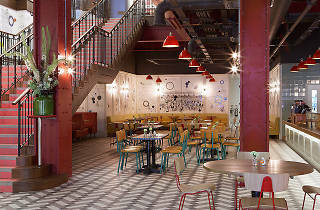 London's most stylish new cinema, inside the Trocadero. Seven screens playing a mix of quality mainstream, indie, foreign language and documentaries. Plus a ground floor cafe, first floor bar-restaurant and a newly opened members' bar across two floors with a roof terrace revealing stunning views. This is my favourite place in London right now. The coffee shop downstairs is great (try the Lemon drizzle cake with rosemary and olive oil - doesn't sound like it should work but ....so does!). The bar on the first floor is cool, although they can only serve you alcohol if you have a cinema ticket! The choice of films available is brilliant. However, the most amazing thing about this place is the members bar - 3 floors of relative calm just steps away from the hustle of Piccadilly Circus, Leicester Square and Shaftsbury Avenue! Even more than this, you can sip your cocktail in a corner window of the bar and watch the madness going on 2,3 or 4 floors below! The roof terrace has great urban views in every direction, we were lucky enough to be there on a sunny afternoon, I suspect it might be chilly come winter!...... but really...wow! The pictures are the view from the corner table on the second floor and the roof terrace. Excuse my packing while I write this, it's just that I'm moving into the Picturehouse Central and don't have any time to waste. Ahhhh, sadly that's not quite true. I wish it were because frankly, this place is amazing. From the screens - super comfy seats with a gentle recline & a great view from wherever you sit - to the ambience - all red bricks, giant light bulbs & old school letters spelling out your film choices - to the food - a funky bar, a baked-goods stuffed coffee shop & donuts du jour from Crosstown - this is a cinema, and then some. Located in the site of the old Shaftesbury Avenue Cineworld and putting that and all other chains to shame, it's the kind of place that knows exactly what people want from a movie going experience; to be welcomed by genuine staff, to feel valued as a customer and to slip into another world, not only through the film you're watching but through every aspect of the place you're watching it in. Whether it's the epic 'Mission Impossible' in Dolby Atmos which really has to be heard to be believed or the chuckle & surreptitious tear inducing 'Inside Out', prepare to feel very spoilt during your visit here and very depressed if you find yourself anywhere else in the film going experiences of the future. A gem of a cinema. Just a few minutes from the tourist trap of Leicester Square, you'll find Picturehouse Central. Reasonably priced, with a wide selection of movies. The bar inside is great in it's own right too. This has definitely become my cinema of choice. Picture house central... my new summer hangout! With an intimate members only rooftop over looking Haymarket, this really is a gem! Membership gives you discounted food and drinks plus access to the members only lounge and bar and 4 cinema tickets! Plus with the membership you can take 3 friends onto rooftop. Film, food and views...what more could you want? Definitely my favourite movie theatre in London! Ever since I began a member, I've been enjoying the place even more. Membership at Picturehouse Central gives you access to the Members' Lounge/Bar, which is a great way to relax before or after your movie or even to chill in if you're in the area. The Members' area is equipped with free wifi, so you can bring your laptop in to do some work, which I've done and is a nice change of environment. It does get a bit busier in the evenings and on the weekends, but it's calm during the day! Coupled with comfortable chairs and sofas, it's a relaxing atmosphere. The Members' Bar is also really great, as drinks are discounted and you don't require a movie ticket to purchase drinks until 9pm. They also serve some food, which makes it even better to spend the day at! I've always had the friendliest of staff, from the entrance all the way into the Members' area and at the bar. The clientele are equally respectful and friendly - people mind their own business and are never too loud or rowdy. The movie theatres are very comfortable and warm, they often offer blankets at the entrance to each theatre as well, which is great. What I like most is that when booking tickets online, it doesn't cost any more to select a sofa seat (for couples or just to be more comfortable) than a regular seat. Overall, it's a great experience from beginning to end! Would definitely recommend buying membership, as it pays off over the year and you receive 2 free movie tickets when you sign up. This cinema is perfect to while away a few hours with its cafe downstairs and the bar upstairs. They serve food although we didn’t eat here. Despite manic streets outside full of tourists and visitors to London, the cinema didn’t feel too busy and we managed to get a seat in the bar upstairs. We ordered coffee and there was some confusion over whether they had soya milk (they couldn’t find it!). We also ordered soft drinks which were disappointingly served with plastic single use straws. I’m pretty sure most places are phasing these out now - you can’t fail to see the campaigns about plastic straws now - so for a trendy venue like this cinema I was surprised to be given one. Nobody really wants straws anyway surely!!? In the cinema screening room itself we got a sofa to share that was mega comfy - highly recommend watching a film here. I was really looking forward to visiting this cinema as I love going to the pictures around Leicester Square for the big Hollywood effect. When you walk in the first thing you notice is the bar/ restaurant area downstairs heaving with people, even though we went on a Sunday night. Once upstairs the place has a lovely atmosphere about it with another fancier art deco style bar to the left if you fancy a tipple before the cinema in a bar that doesn’t just feel like a cinema bar. I have to say I was expecting more for the price of my ticket, as for £16.50 a ticket it is a steep asking price regardless of how handy and central the location! The theatres are small and cosy which is nice but I was kind of expecting a big one for the big cinema affect. It's a nice space but not special enough to warrant the hefty price tag in comparison to independent cinema’s around London with just as much character. As far as cinema goes, this place is my spiritual home. The space is quirky but comfortable, the food is great (though you have to pick your table for it - trying to eat steak off a board from an armchair is probably not the best way to maintain your dignity), and the drinks are good. The staff have never been anything but friendly and helpful, and I been to some amazing events here. The breadth of film on show is inspiring, and you can usually find something new to challenge what's on at the local Vue. As a member I can also confirm that the Members' Bar and terrace are an absolute delight! Picturehouse Central is an absolute must-visit! So glad they renovated this space, the theatres are huge and comfortable. Also a nice place to just and have a cup of tea when the weather is awful outside. I came to this cinema last month and I must say.. I have been missing out! This cinema is just chic in every way... Clean and no funky smells lingering in places. What I loved most about this cinema though,were the actual seats. Comfortable and cosy unlike the usual stiff sticky smelling ones on other cinemas. Highly recommended! So I have to say my first experience of the Picturehouse wasn't my favourite and I was left disappointed. The entrance for The Picturehouse is quirky and retro. I went to a Cars 3 screening with a Q and A with Owen Wilson, the producer and the director. I was intrigued to see how the event would run as I've never been to anything like it. I arrived, went upstairs, got given my ticket and moved swiftly to the theatre avoiding the sweets and popcorn! I went to the theatre to find that someone had also been given the same seat as me - I wasn't the only one who had experienced this problem. We were given different seats at the back of the theatre which weren't as good as our seats near the front. This happened to my friends twice with even the alternative tickets being taken by other guests. Pretty bad organisation for such an event. The theatre seats however were quite comfortable and also reclined. Every seat had a cup holder which bearing in mind I did go to watch a film mainly watched by kids, were constantly being messed around with and became infuriating! The seats!!! The seats have a little recline so you can get very comfy before and during the film…. After? Well you wont want to leave! 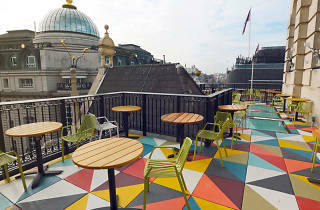 If you are lucky enough to be a private member or know someone who is, the roof top terrace is beautiful with a view over Picadilly. I loved seeing the hustle and bustle of the place and it’s a rare place you can see what is painted on top of the double deckers. Its also like a little oasis of calm where you can see the world go past and at the same time catch up on old memories with friends or do some cheeky work before seeing a film. All in all pip pip! An amazing venue and if I was a cinema buff I would for sure be a member of this cinema over all the others in our city. I've never been to Picturehouse Central before and the minute I saw it I was impressed. Hidden away in the Trocadero building, it is a gem. Downstairs has a coffee bar with great looking cakes. Up the stairs is the theatre lobby and another coffee bar type area. Friendly, helpful staff. Inside the theatre are really comfy seats that recline back with plenty of space to stretch out. It all made me want to watch all my films here. A member of our group is a club member and was able to take us for a tour of the bar and rooftop area. Wow! Stunning views and lots of comfy nooks to curl up and spend some time above London. The membership information is on the website for you to look at.i think it's well worth it and will be signing up soon. “Can I Be Me,” is what Whitney Houston would say during her early days in music, so it seems the perfect fit as the title of a new documentary on the music icons life. Acclaimed director Nick Broomfield and Filmmaker Rudi Dolezal tell the story and share never-ever seen before footage of one of the most successful female artist that lived. We see rare behind the scenes footage of Whitney as a teen to her later days with ex husband Bobby Brown and life on the road. I felt I knew everything about this amazing, beautiful troubled woman but this documentary left me feeling very sad and reflective plus learning more. You hear from her close friends and people that worked with her daily on what she was really like and how much she relied on drugs and drink to keep it all going. Earlier in the day I had been at a studio to interview Lethal Bizzle for my new podcast. While I waited my turn in the green room the conversation had somehow spread to “Who is the worse person you have ever interviewed Max” ? There would have been a time I would have got sucked into a long negative almost gossiping type of conversation about this subject but not now. Why couldn’t the question of been ‘Who has been your fav person to interview’? I have so many friends that are musicians and in the public eye who struggle with fame and being judged. It can make them feel so uncomfortable and sometimes paranoid resulting in being quieter and less social. Having said that I do believe being polite and professional is not difficult so we all have to work on being at-least that. I feel like we hero worship musicians so much that we don’t allow them to make mistakes or have bad days. Watching the Whitney doc made me really think about the characters she created to live up to the expectations that the world had of her, but also her own. How incredibly sad that the love she wanted to share with her daughter, husband and family almost became something she had no time or energy for. What I took from watching this documentary was not only what a tragedy it was and how the world lost such an amazing musician but also how she was more then a star. This was a woman that was funny, kind, loving and full of so much energy. She had so many issues and took drugs and drink rather then counselling and having chill out time with loved ones. You see a hint of her wanting to change and take time out for her well being but always getting dragged back into the world of fame and success to provide the lifestyle she wanted to give to everyone around her and herself I think. Everything isn’t about money and success, happiness is so underrated but so very important. I will always remember Whitney as an incredible singer and a lady that has contributed so much to music, but she was also a loving mum, daughter and friend to many. This documentary may have showed the drugs but it also reminded me that we should not remember or define her by just that memory. Whitney ( Nippy as she was affectionately known) as a young black teenager from New Jersey changed the world of music and opened the doors for the likes of Beyonce and Rihanna. “Can I Be Me” is out now all across the UK and I strongly recommend you watch it? Picturehouse central is one of the best cinema's I have ever been to. At the entrance level is a cafe which is a great spot for catching up with a friend over coffee or getting a quick bite before a movie. It is beautifully decorated in a modern industrial style. They have a range of food options and snacks on offer at a reasonable price. On the first floor level there is a lounge bar area, this is a perfect date night venue. Highly recommend. For members, there is a members bar and rooftop terrace which boosts some fantastic views! Members are allowed up to 3 guests, in case you're friends with one. This may just be the best cinema in London! The seats are comfy (with couples sofas at the back of most screens). The candy options, bar outside is amazing, and the cafe (as nicknickn says) has some amazing cakes and treats as well. Among the many criterias you can judge a cinema on (e.g. snack selection, decor ect.) cinemas only need to satisfy basic three criteria for me: screen and comfort. On that, I’d say Picturehouse does a pretty good job. Sitting on the same site as the old Cineworld in Trocadero (I knew my surroundings felt familiar somewhat despite this being my first visit!) 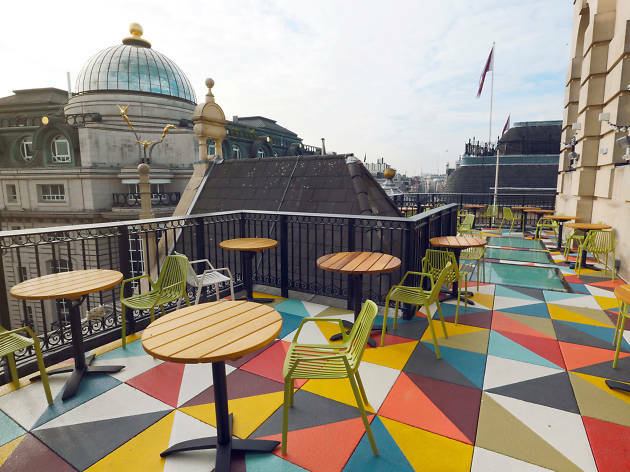 this Piccadilly Circus-based cinema boasts seven screens, a cafe, bars, and a members-only bar with a roof terrace overlooking busy Central London. The screens are big and immersive enough, seats are plush, comfy, reclines and offer plenty of legroom for the daddy long-legs amongst us. Decor is a nice touch too with its art murals and grand staircase reminiscent of the rip-roaring 1940’s USA thus providing a sense of excitement and anticipation. Ultimately, a nice change from your usual Cineworld/Odeon cinema experience. Picturehouse Central does everything you’d expect from a cinema well with a few touches and extras but really nothing for me that sets it apart that makes me want to revisit any time soon. I honestly cannot find a better cinema in London. Picturehouse is central, beautiful, the lights are wonderful and there is also a lovely eatery over the ground floor for your before/after movie coffee & cake. Not everyone knows this place, and going there is such a treat. Seats are super comfortable, sound system is perfect, staff is very kind and helpful, there's a wonderful view from the roof terrace. This place has everything! Exactly what a trip to the pictures should be! The timeless elegance of the lobby/cafe on the ground floor paired with the ultra luxurious seating and screens of the cinema make this a real gem. Considering your proximity to Shaftesbury Avenue, Piccadilly Circus and Leicester Square, you could be in a totally different city when inside the four walls of the Picturehouse Central. Surprisingly this cinema is also part of the Meerkat Movies 241 promotion that Compare the Market has been running, which means you can pick up a couple of tickets for around £13! An absolute bargain when compared to some of the chain cinemas. They also have a vast array of meals/snacks you can take in with you, so no need to grab dinner on the way. Me and my fellow Tastemaker pal Zoë F opted for a portion of mac and cheese each, and were also tempted by the plethora of sweet treats staring at us on the counter. I tried the cheese cake, which probably wasn't the best idea after eating mac and cheese, but was still super tasty! This will definitely become my new cinema of choice, the film times are very convenient with finishing work, the prices reasonable and the food is good. Not to mention the stunning architecture and design inside! Would highly recommend, and if I could it would have been awarded 6 stars! This is such a nice place to hang out - and let's be honest you can't say that about a lot of places around Piccadilly Circus. Huge, airy ground floor cafe, classy first floor restaurant and also 7 cinema screens with the comfiest of seats. And if you're an advocate of posh cinema snacks, prepare to get excited: there are all manner of fancy nibbles here including the oh-so-pretty Crosstown doughnuts. The only downside is that cinema tickets are pretty pricey, you can get around that though by paying a visit on a Monday evening when tickets are cheaper or searching out the Docs and repertory films which are only £8. I love this cinema. I'm generally a fan of all cinemas but this one is definitely the most fancy cinema you can visit in London that you can visit without a special excuse. With £13 tickets on Monday and Wednesdays, it's the same price as any other high street cinema but you get the added value of an insane selection of treats, swish bars, a restaurant and comfy reclining chairs. Character, charm and atmosphere are not things you tend to associate with cinemas but Picturehouse Central embodies all of these perfectly. I have walked passed this place every day on my way to the office for the past 8 month and it has always had me intrigued, can’t believe it has taken me this long to truly discover it, don’t know what I was waiting for I wish I’d visited sooner. Decided to go on a cinema date with a friend (and fellow Tastemaker Hollibakes) as we both wanted to ball our eyes out to “Me Before You” – but I’ll save the details of this for a film review to follow – back to the cinema… I was surprised to find it listed as on option to use with Meerkat Movies 2 for 1 offer on Tuesdays and Wednesdays, this meant its cost just £13 for both of our tickets, although this was just the icing on the cake as given the experience we had I would have been happy to pay double and then some. As you walk in you are greeted on the ground floor buy a relaxed and spacious café – one of my first impressions was that I was very surprised by the overall size of the space this cinema occupies, but they do fill it so well! The café serves a nice selection of foods all of which are able to put into takeaway containers in order for you to take into the screening with you, this certainly was a big thumbs us from us as both coming straight from finishing work we hadn’t had time to grab anything in the way of dinner. We both opted for the Mac n Cheese, was reasonably priced at £6.50 for a good portion size and was very enjoyable! Other hot food options included lasagne and an aubergine thing (sorry I can’t remember what this was specifically) and there was also a choice of cold salads. Though I wasn’t planning on buying any sweet treats, I couldn’t help but be persuaded but the vast offering of cakes displayed at the counter – all of which looked very tempting -I eventually decided on a white chocolate and raspberry brownie which did not disappoint and was as delicious as it sounds. As far as drinks go they cover all bases, selling hot beverages, soft drinks and alcoholic tipples too. Up the elegant insta-worthy staircase to the first floor there is a restaurant and bar area to your left, which I’d like to perhaps try out another time when not in such a rush. Then the box office area to your right when tickets are purchased and unsurprisingly offers even more items to satisfy your sweet tooth, with a well presented pick n mix station - although I did observe this was on the expensive side (to be expected, as cinema sweets usually are). We were in screen 2, which along with screen 1 and the members only bar (jealous!) are located up an escalator to level 2. The screen was a really good size for the space, larger than I would have expected and the picture and sound quality were both great. The seats were very comfortable indeed, with a recline which moves with you allowing you to pick your preferred angle viewing for viewing – and don’t worry about annoying those behind you as legroom is so generous they won’t even know you’re there. Thank you to Picturehouse for bringing the special touch back to a trip to the cinema, making an outing to “the pictures” just the way it should be! In case you can’t already tell I’m over the moon to have come across this place, honestly cannot recommend it enough, so much so I’ll be returning next week. The entrance to the Picturehouse was breathtaking. They celebrated their first birthday and they were giving out £1 cinema tickets which was just fantastic. It was such a creative and calm atmosphere with so many people at the Cafe on the first floor with an incredible menu. It was a glorious moment to walk up the stairs and these intricate lightbulbs hanging beautifully above me. The whole ambient inside is amazing and it's interior design is great. They have the most spacious and comfortable cinema rooms. I couldn't ask for better seating, it was a great experience and it was my first time being at the Picturehouse Central. A must go venue for all located at the corner of Great Windmill Street and Shaftesbury Avenue in London's Piccadilly. Thank you to all at the venue for a great afternoon. #TOTastemaker Love MD. Yesterday (June 11th) marked the 1st Birthday for Picturehouse Central. To celebrate all of the tickets to their screenings were £1 each. Yep, £1 tickets for not only a central London cinema but one of the best central London cinemas there is. I did the obvious thing any rational human being would do and got tickets for four different preview screenings (okay maybe I should say any cinephile would do). That meant I spent 12 hours straight at Picturehouse Central yesterday. I've visited the cinema countless times this past year, but never 12 hours in one day. Doing so simply reinforced how much I love this cinema. I saw four fantastic films all before their UK release date. I got to sit in comfortable style in their amazing screens. I got to spend my two one-hour breaks in the cafe and bar respectively paying reasonable (after my membership discount) prices for properly tasty food. I had a brilliant time and my metaphorical relationship with the cinema has never been stronger. Whenever I have friends visiting London I always take them here as it is a breath-takingly gorgeous building with an incredible atmosphere. I love it here and I think most people would too. I remember a cinema in Trocadero: stinky, dirty, with mice running around and toilets permanently only partly lit. 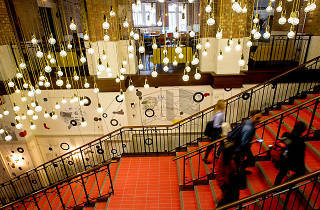 Seeing its metamorphosis since Picturehouse has taken over was a mixture of shock and awe. That is the definitely the best cinema I’ve ever been to! Modern, stylish, and the most hipster place you'll find in central London. Once you enter, you forget you have just left the tourist–fested Leicester Square area and you feel as if you've landed in a Soho House which everyone can enjoy without horrendous membership fees. The Ground-Floor café offers lots of yummy options, panini, salads, pastries and cakes along with delicious coffee. For drinks with volume, you need walk up red staircase, feeling like a movie star heading to Oscars. The whole place is just great, filled up with beautiful colourful furniture fashionably matching the geometrical patterned floors and doodle walls. What I also love about this cinema is that they play some many independent films, plus lots of documentaries. It is also home of this year’s edition of the Sundance Festival in London. The reclining seats are so comfortable that you have to be careful to not to fall asleep, thought with the massive screen and excellent sound, maybe it wouldn't be so easy. Last but not least, if you have a dog, who is scared to be home alone, you can bring it to a special dog-friendly screenings. Not sure works in practice, but the idea is awesome! Sadly, I haven’t discovered the rooftop with view over central London, but already planning another visit to the venue, it won’t be long. One of the most beautifully decorated and comfortable cinemas and located in the heart of London. It might be a cinema, but this is one of my favourite hangouts in the area - great cafe! I visited Picturehouse Central a while ago with TimeOut card to watch a documentary as part of a festival and it was a pleasant surprise - I didn't know of it before. Extremely new (it opened last summer), right in the heart of London moments away from Picadilly circus and Leicester square. The interior is funky, stylish, new and seriously amazing! It is completely different from the chain or local cinemas I was used to. It makes the whole experience even better. The building is very interesting from an architectural perspective, both from the outside and the inside. The screening rooms are amazing - big screens and so comfortable seats! First class cinema, but obviously slightly more expensive than the chains. Good value on Mondays and Wednesdays, though! I had to share this photo - and see others have done the same. There are some places in London where just looking out gives you a sense of occasion. The corner table on the Club Level here is just one such place. Picturehouse Central is a great venue to see a film - its equally a good spot just to hang out. Very civil and just metres from Piccadilly Circus. The coolest cinema for miles around, and considering it's a stone's throw from the PCC, the ICA, the Curzon, and a couple of cinemas with the best screens in the city (OLS and Empire) that's saying something. Wow. Wow wow wow. I came here for an event. The cinema is lovely, and when you lean back, the seats move with you, to give you a better viewing angle. The salted caramel brownies there are to die for! Proper classy joint! Absolutely love the venue. It some how feels quiet on the inside, and the stress of the busy street outside a million miles away. The screens are gorgeous, massive comfy sofa seats. The bar upstairs is like a set Mad Men (at the moment you can only drink here with a cinema ticket so it was also nice and empty, very relaxing). We went to see a screening of the last Peep Show episode with a Q&A after, the whole event was well organised and good value, very much hope they continue. A little piece of vintage glamour set in the heart of Picadilly, this is what is must have been like to go to the cinema back in the day! The decor is stylish, with 2 bar/restaurants to choose from, this makes going to the cinema a real event! The seats in the screen room were big and comfortable. I loved this and can't wait to go back! This is a very impressive addition to the Picturehouse franchise. The ground floor cafe looked like a great place to pop into, even if you're not seeing a movie. The food at the first floor restaurant wasn't anything outstanding, but still good. The theatre that I saw a movie in had couch seats for two in the back two rows which was a fun touch. The main drawback is the ticket price - £16 for a normal film screening! I’m a member of the Hackney Picturehouse which doesn’t normally allow for access to the Picturehouse Central Member’s Bar, but luckily for the rest of August it does! The bar feels very relaxed with comfy lounge chair and lots of space to spread out. The bar spans over three floors including a fantastic roof terrace that’s definitely worth checking out and each floor has great views over Haymarket and Piccadilly. They offer a small bar menu and six beers on tap. Cocktails cost £9.50, but at least the Picturehouse Membership gives 10% off of the whole bill. This place took your average cinema and improved it 100 fold on every level. The screens are huge, the seats are super comfy (and they recline), the leg room is generous, the setting is beyond beautiful and the food is great, this is the way cinema should be. The cafe downstairs does great coffee and a gorgeous selection of cakes as well as some savoury delights. The bar area upstairs is very cool and the menu is tasty. This is a cinema beyond cinemas and I am without a doubt a massive fan. This is officially my new favorite cinema in London. Having been to the Clapham branch a few times before I expected this to be similar and equally as small. I was pleasantly surprised to see this new cinema is huge and has a fantastic bar. The main appeal of the bar for me was that you cannot use it without having a cinema ticket, meaning it doesn't get over crowded by bar hoppers in central London. I even had the joy of being seating beside comedian Sean Walsh while enjoying my Gin and Tonic (which had copious amounts of Rosemary and Thyme in it). The cinema itself is incredibly spacious and I was most impressed by there being room to walk past those already seated without sticking your bum in their faces. The seats also recline which makes the whole experience that much more comfortable. I do not see me visiting another cinema for a while now, I am off to sign up for the membership! Am actually quite shocked to read these reviews on here. Is it the same place? Do people only care about decor? Second attempt to come here last night (first attempt they had whored it all out to a corporate at last minute with no notice. Fun if you've travelled an hour to visit). Film: pretty good but sound was too quiet and so could hear everyone talking and eating. Seats lean back: result... However, when doing so they jerk the whole row meaning other people are involuntarily moving you the whole way through. Also- it's freezing! Air con in late Oct? Why? Went to the newly opened members bar last night. I'll start by saying I love the Picturehouse - it's totally gorgeous & a great place to watch a film & hang out. I really want it to succeed. But I really think they need to sort out their service. The members bar is beautiful & I love seeing my name in the plaque on the wall. But we popped in with about 25 mins before our film, I ordered 2 cocktails, which I had to stand at the bar & wait for - they took what seemed like ages to make! I'd gone for cocktails as in the 6-7 happy hour they are £7 each, but then I got charged £17+. It then took another 10/15 mins to sort out the refund. So our relaxing & glamorous drink turned out to be quite stressful. That said my Apperisecco was delicious! By far the BEST cinema in the West End!!! Like the theme tune from Toys R Us but take out "Toys R Us" for Picturehouse and "Toys" for films. The best place to see a movie north of the river. Hot dogs in the bar to die for. Best cinema in Central London! Love this cinema. It has a lovely cafe, a brilliant bar and the and the candy shop (doughnuts/sweets/chocs) is a great touch. A great place to go to even if you are not going to watch a film and if you do go into the actual cinema the seats are comfy indeed. When I first spotted this gem of a cinema, located off Shaftesbury avenue at the base of the Trocadero, I was instantly drawn to its glitzy old-school charms, and walked in confused as to why I'd not seen nor heard of it until that moment. Killing three hours in this place was no problem. Grabbed a soya latte (£2.50) and a London Film Festival magazine (free of charge), then sat at a comfortable corner table backed against the far wall of the impressively tiled, well-lit downstairs cafe (see photo), from where I could absorb the atmosphere and read in peace (or, if I'd wanted to, eavesdrop, which I of course did not do). Filled my glass with their self-pour iced lemon water more than a few times, I don't mind admitting to it. Going back to the Picturehouse as soon as possible is a priority; this place is magical. May or may not be a cheapskate post-uni pre-graduate sort-of-but-not-really-anymore student next time around. I do love a cinema that has a bar. I prefer a cinema where I can have a drink while watching a film, especially at £18 a ticket, but I’ll settle for a Riesling before and a Crosstown doughnut during. Or I would if I hadn’t had a very filling chorizo, feta and, balsamic onion pizza and sweet potato fries in the restaurant, leaving no space for a doughnut du jour or any of the other appealing snacks on offer. A welcome addition to the tourist trap that is Piccadilly Circus. Picturehouse central cinema and café, Piccadilly recently opened and tucked away and hidden just moments away of the chaos and bustle of Leicester Square. Elegantly decorated with a good assortment of snacks and drinks including amazing doughnuts. This makes is a perfect place to meet with others and if you feel up to it even catch a movie as well. Plenty of seating downstairs and upstairs, this makes going to a cinema in my opinion, a much more special experience compared to your other bog standard cinemas. There is plenty of leg room and the seats are soft and comfy, there are even double seats at the back of each screen. Only thing it was really cold when I last went so turn up the heating a little perhaps or bring plenty of layers, but hopefully that was a one off. Great cinema in the heart of London and a strong competitor to Odeon, Prince Charles and other film venues in the area! Small auditoriums with cosy sofas, good selection of films and a very nice restaurant with pleasant atmosphere, delicious meals (although they could work on their veggie options!) and special Picturehouse brew of IPA. Definitely coming back there soon! Outstanding cinema just off Piccadilly with great facilities; definitely worthwhile experiencing the environment and of course a movie. What a great addition to the London landscape.